On Monday, October 3rd, we had our official “Welcoming Ceremony” at the Navy Yard. We are very grateful to Mayor Michael Nutter, District Attorney Seth Williams, Superintendent Leroy Nunery, and GPIC Director Paul Hallacher for attending and making wonderful remarks! Several publications covered the ceremony, including a terrific article in Flying Kite that really showcased our students, who as usual were the stars of the show. Student Malakiah Hunter served as chair of the event, and kept things running smoothly. We opened with an introduction to the Sustainability Workshop. 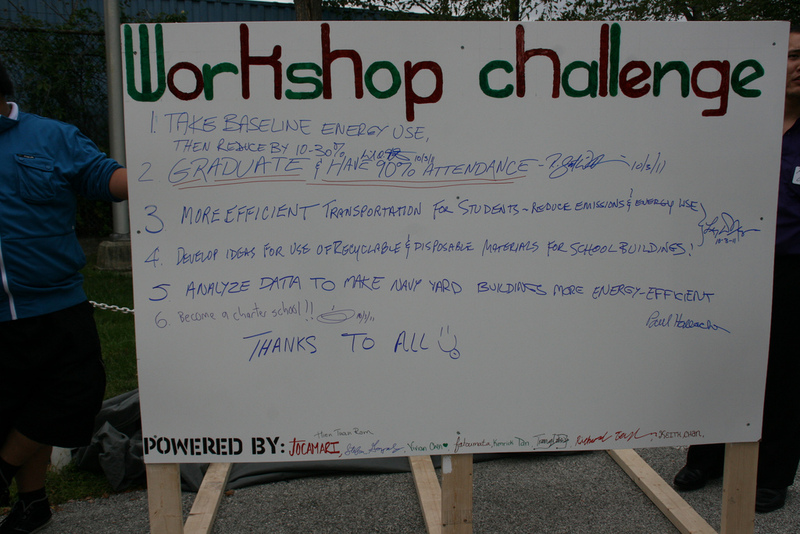 Richard Taylor, another of our students, explained in his own words what the Sustainability Workshop is. The Sustainability Workshop is an innovative school designed to educate students through project based learning, as well as to encourage them to be active participants in the society, and to tackle real word problems. Project based learning is an educational approach whereby theoretical concepts are reinforced and clarified in hands-on experimentation. Our students explained the eight words that we want to describe us, both as individuals and as a learning community: Intelligent, Responsible, Resilient, Observant, Innovative, Respectful, Humble, and Motivated. From there, our featured speakers offered welcoming remarks, but also issued us “challenges” for the year. Mayor Nutter challenged us to establish a baseline measure if energy use for our building (Quarters A), and then seek to reduce usage by 10 to 30 percent by the end of the year. District Attorney Williams challenged us to graduate with an attendance rate of at least 90 percent. Superintendent Nunnery challenged us to find more efficient transportation routes for school district vehicles to reduce fuel usage and vehicle emissions, while Dr. Hallacher asked for our assistance in analyzing building energy usage data on the Navy Yard campus and making recommendations for improvements. Each wrote their challenge on a “challenge board” prepared for the event. These are exactly the kind of problems we want to be working on. They address real problems and involve meaningful partnerships. Above all, they have real consequences. We are not preparing to solve problems sometime in the future, we’re working on solving them right now! Following the official proceedings, soft pretzels and Tastykakes were served. The students gave our guests a guided tour of the building, highlighting their work on the “Who am I?” project that was nearing completion. In some ways, this was the best part of the event, since it gave everyone a chance to meet and talk in smaller groups. This is where our students really shine. They are so poised, and more importantly, so genuine. And their enthusiasm is infectious. It was a terrific day, and we were all excited and proud to be a part of it!